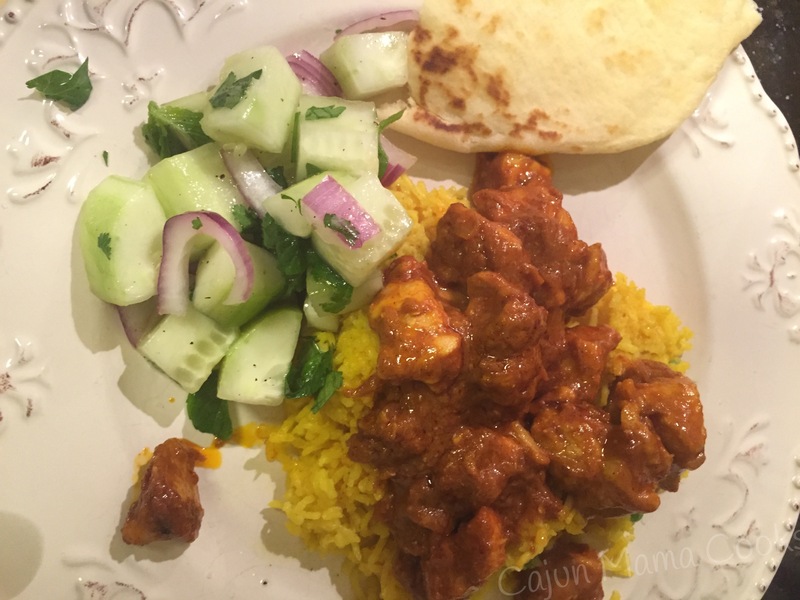 Tikka masala, basmati rice with peas and minted cucumber salad…I am in love with this Indian inspired meal!! This meal right here. This is the one. I make many meals, I try new kinds of foods and I can honestly tell you all that this is one of my favorites thus far. No kidding. Dead serious. I had to make big daddy sign in blood that he really loved it and enjoyed it before I would share the leftovers with him. Ok I did not make him take a blood oath but I grilled him pretty hard. It’s not hard to make really but I did not double the recipe and I was so sad when it was gone. I usually send leftovers to his office the next day but not this time. Not because I don’t love his coworkers (I totally do ) but because I was not a quite certain they would APPRECIATE the wonder that was this meal. Because it is Indian food some people might be a little (or a lot…I am looking at you, Chris Flowers) leery of such a new experience. Let me say this. I am making this again this week and doubling the recipe. The leftovers were even better because the fantastic melee of flavors had a chance to commingle and make friends with one another. My mouth is watering just thinking of having this meal in front of me again. If you have always wanted to try Indian food but felt intimidated by the notion, don’t be. This is super simple, easy peasy. The ingredients are not even that far fetched. It just requires quite a few spices. Now, I had all of them but I cook a lot. 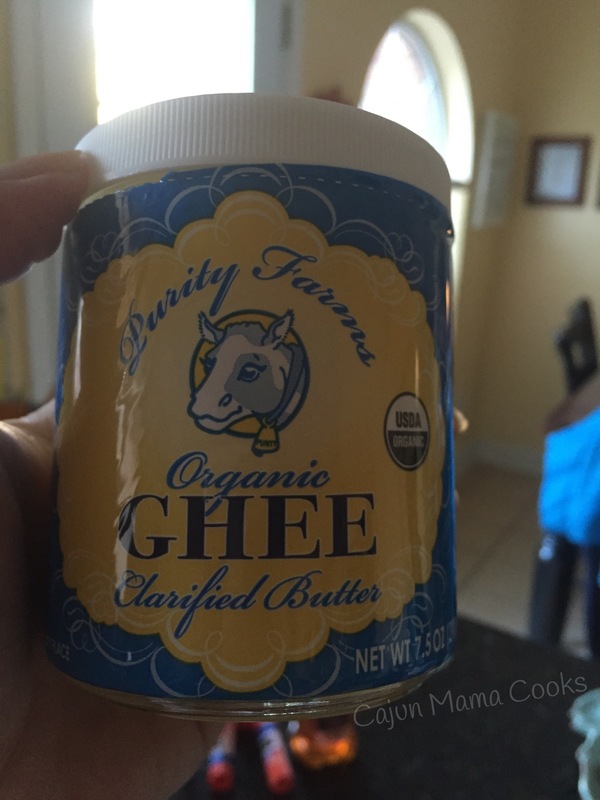 I ordered the ghee off of amazon and it was here in a flash. I imagine world market might have it and you can make it yourself if you are so inclined. It’s essentially clarified butter and can be made at home. The ghee and some of the spices will be the main thing you might have to buy that is out of the norm, but please don’t let that stop you . Anyway, this is absolutely doable for anyone who wants to try Indian food. I have never eaten at an Indian restaurant but I know tikka masala is a very popular dish. The rice and salad are both pretty standard dishes that are pretty commonly served with Indian main dishes. I found the naan at target and it was absolutely fantastic. I saw it at Brookshires as well. It was a perfect accompaniment to this meal. Let me know what you think if you decide to try this. As I said, it is on my top 10 list of most delicious meals I have cooked. Cajun mama went to India and she liked it. Traveling while I stay in my own home…that’s right up my homebody ally. I would love to hear from any of my readers who live in India. Does this vary greatly from how you make it? I know I have a few readers located in India, so feel free to chime in. How close is this to an authentic meal in your country? What’s different? Add all ingredients except the peas to your rice cooker. Give it a stir and then turn on rice cooker and let it cook. Do not mess with it. If you don’t have a rice cooker (why?!! ), then just cook it in a pot but same thing…let it cook and don’t mess with it. After it’s done, stir in the peas. Mine were frozen and defrosted as they were warmed up by the cooked rice. 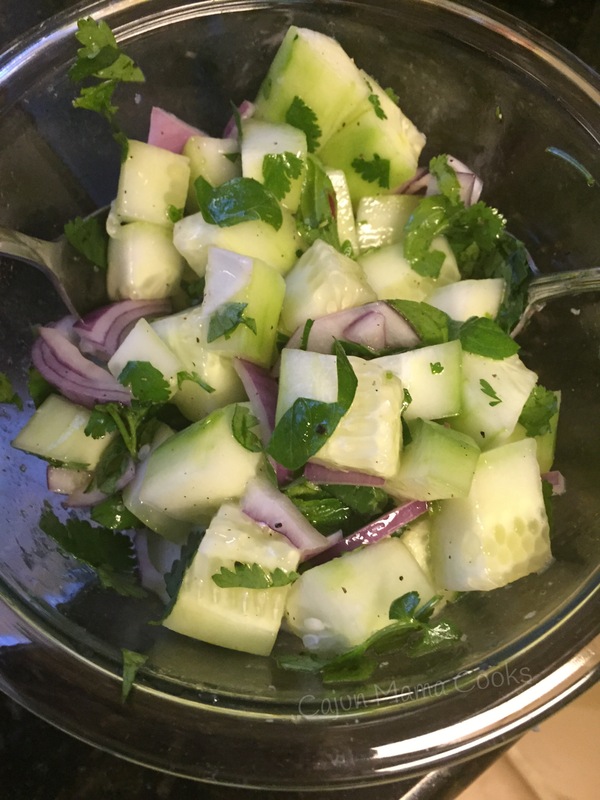 Ok now…the minted cucumber salad can be prepared ahead of time and it gives the flavors a chance to meld together. Just a suggestion. The coolness of the salad from the cilantro and mint is an excellent counterpart to the slight spiciness of the tikka masala. Excellent combo. Add sliced cucumber and the purple onion to a bowl. Toss in half of the cilantro and mint. Drizzle with olive oil and toss in the lemon juice. Sprinkle with salt and pepper. Give it a stir and taste. Add more salt and pepper if needed. Refrigerate until ready to serve. Before serving, add a little more mint and cilantro. To be honest I used it all at once and I was not sorry. The freshness of the mint and cilantro with the cucumber and onion is a thrill ride. Enjoy. Now…for the star of our show! 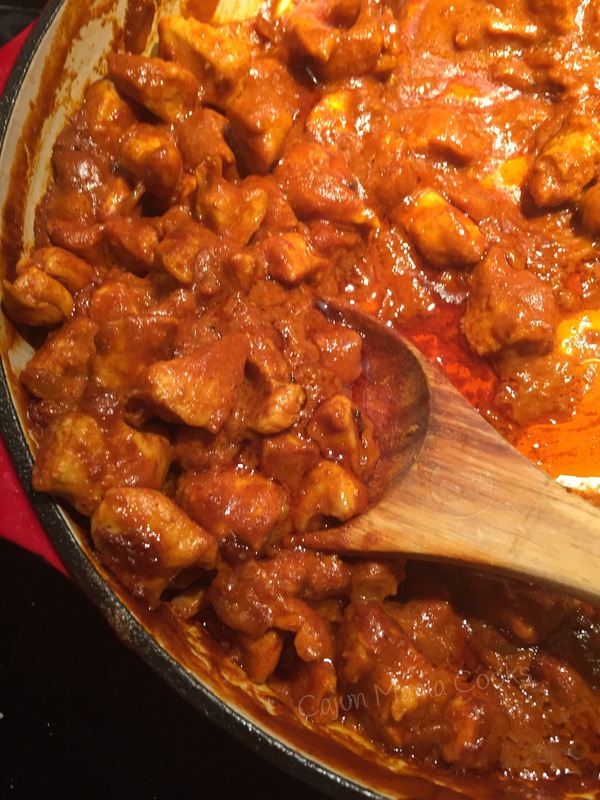 The most fragrant, full of lovely flavors, just spicy enough and fit for an Indian prince…tikka masala to the stars!! I mean…some stars might have tried this recipe, who am I to say they have not?! I have not ever tried another recipe for this but I can say it fulfilled every expectation I had. I will look no further! I had a friend who tried one and it was fancy and it left her hanging. So I think this one is a winner. I found it on http://www.allrecipes.com. Tikka means “little bits” and masala means “spices”. Sure enough! This dish smells so heavenly when it is cooking. My biggest piece of advice is to double the recipe. Just saying. Warm ghee over medium heat in a large skillet. Add the onions and cook until they are translucent. Stir in the garlic and cook another minute or so. You know the drill…when the garlic is fragrant, you are golden. 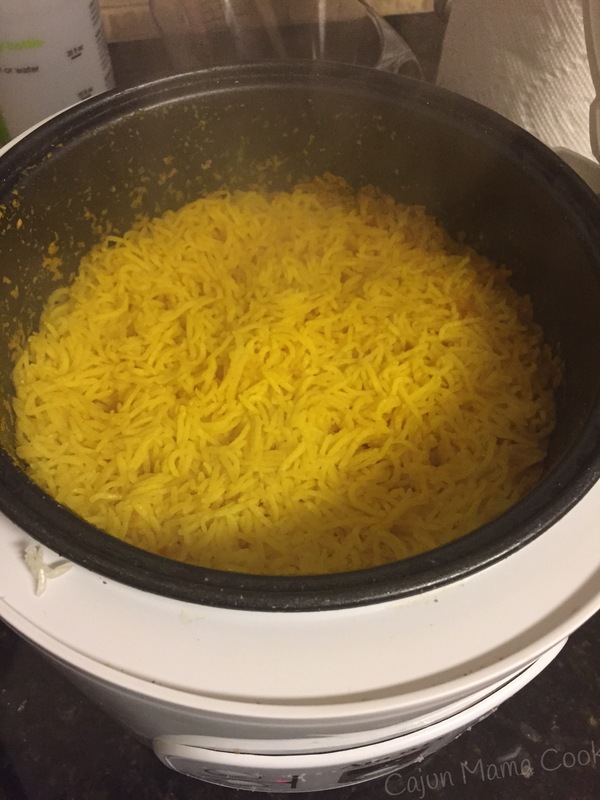 Stir in 1 teaspoon of salt, the cumin, ginger, turmeric, cinnamon, and cayenne. Cook for about another 2 minutes or until fragrant. This will make you salivate and you will know why I love this recipe. Good things are happening ya’ll. 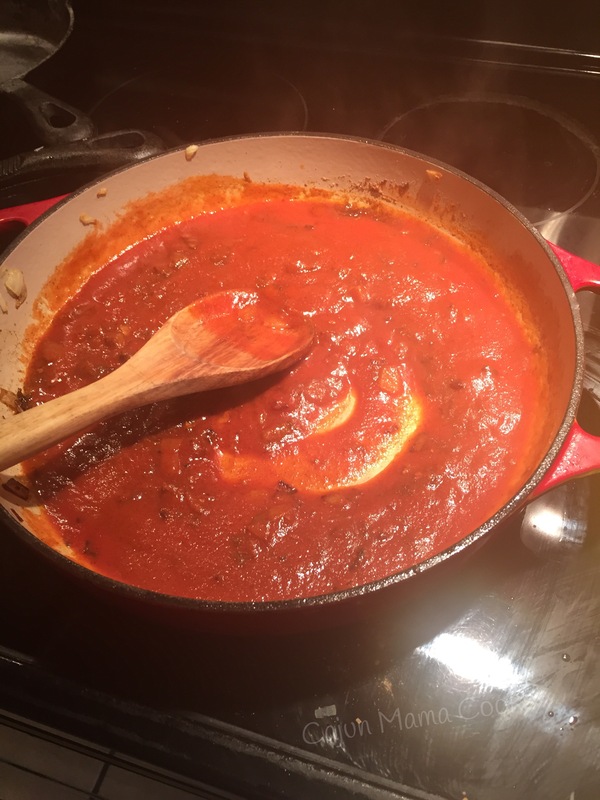 Ok…now, whisk in the tomato sauce. Bring to a boil and then reduce heat. Simmer for about 10 minutes and then whisk in the whipping cream. Stir in the paprika and 1 tablespoon of sugar. Bring this luscious concoction back to a simmer and allow it to simmer another 10-15 minutes, or until thickened. While this is simmering, heat the cooking oil in a separate skillet over medium heat. Stir chicken into the hot oil and sprinkle with curry powder. Working in batches if necessary, cook until browned but still has some pink on the inside. This won’t take long I allow it to cook on one side for a few minutes and then use a spatula to sort of flip the chicken. This gives it a stir fried effect that I like. Do the next batch and then done. Transfer the chicken to the simmering sauce (say that 3 times) and allow it to simmer in that highly fragrant sauce until chicken is no longer pink inside. Adjust flavor by sprinkling in more salt and sugar as necessary. I could eat this at least once a month. Maybe more.